$499 DOWN Guaranteed Approval!!! This Ford includes: WHEELS: 18" PREMIUM PAINTED DARK STAINLESS Aluminum Wheels EQUIPMENT GROUP 600A *GROSS* ENGINE: 2.0L IVCT ATKINSON CYCLE 4 Cylinder Engine Gas/Electric Hybrid STANDARD PAINT POWER MOONROOF Universal Garage Door Opener Generic Sun/Moonroof Sun/Moonroof TIRES: 18" FUSION SE HYBRID TECHNOLOGY PACKAGE Smart Device Integration Rear Parking Aid Telematics Auxiliary Audio Input MP3 Player TRANSMISSION: ECVT AUTOMATIC (STD) CVT Transmission A/T EBONY, HEATED LEATHER FRONT BUCKET SEATS Mirror Memory Seat Memory Power Passenger Seat Power Driver Seat Heated Front Seat(s) Leather Seats Driver Adjustable Lumbar Bucket Seats TIRES: 18" Tires - Front Performance Tires - Rear Performance 50-STATE EMISSIONS SYSTEM SHADOW BLACK FUSION SE HYBRID COLD WEATHER PACKAGE Integrated Turn Signal Mirrors Heated Mirrors Floor Mats Heated Front Seat(s) *Note - For third party subscriptions or services, please contact the dealer for more information. * Save money at the pump with this fuel-sipping Ford Fusion. Added comfort with contemporary style is the leather interior to heighten the quality and craftsmanship for the Ford Fusion Well-equipped, well-cared for and still covered under the manufacter's factory warranty. Beautiful exterior. Clean interior. This Ford Fusion is so immaculate it is practically new. More information about the 2017 Ford Fusion: The Ford Fusion is a mid-sized sedan and must therefore compete in an incredibly competitive segment, going up against heavyweights such as the Toyota Camry and Honda Accord. Ford has priced the car accordingly, with models starting at $22,000. 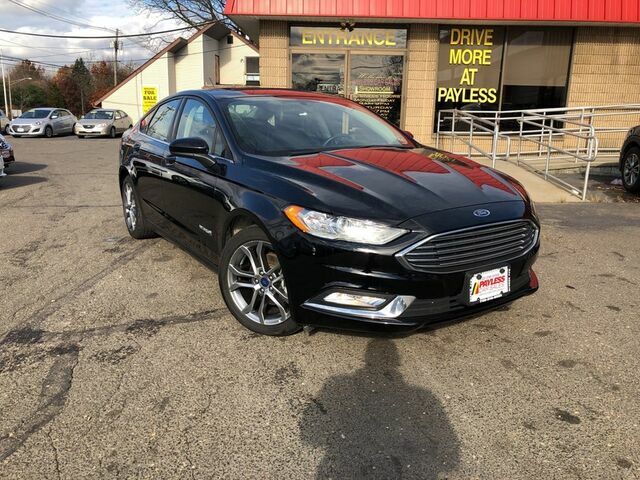 On the other end of the price spectrum, the Fusion Platinum is outfitted with a variety of luxury equipment, providing a sensible alternative to the entry-level cars sold by several luxury marques. And in the new Fusion Sport, a 325-horsepower turbocharged V6 provides plenty of punch for those looking to cruise in the fast lane. Strengths of this model include stylish, practical, available turbocharged V6, available plug-in hybrid drivetrain, available all-wheel drive, and Efficient Call now (732) 316-5555 This one won't last! Whether you have good credit, bad credit, no credit or even in a bankruptcy or repossession we can help. Our goal is 100% guaranteed approval!! Call us at 732-316-5555 or come on in to our South Amboy, New Jersey showroom and one of our credit specialists will help you get the vehicle you deserve at a payment you can afford. The advertised price does not include sales tax, title, DMV fees, finance charges, prep fee and documentation charge of $289. All financing subject to lender approval, rates and terms may vary. Any payments listed are an example and not an offer or guarantee or terms and are subject to lender assessment of credit,down payment and term. Prices subject to change at any time. While every reasonable effort is made to ensure the accuracy of this information, we are not responsible for any errors or omissions contained on these pages. Please verify any information in question with your sales representative.